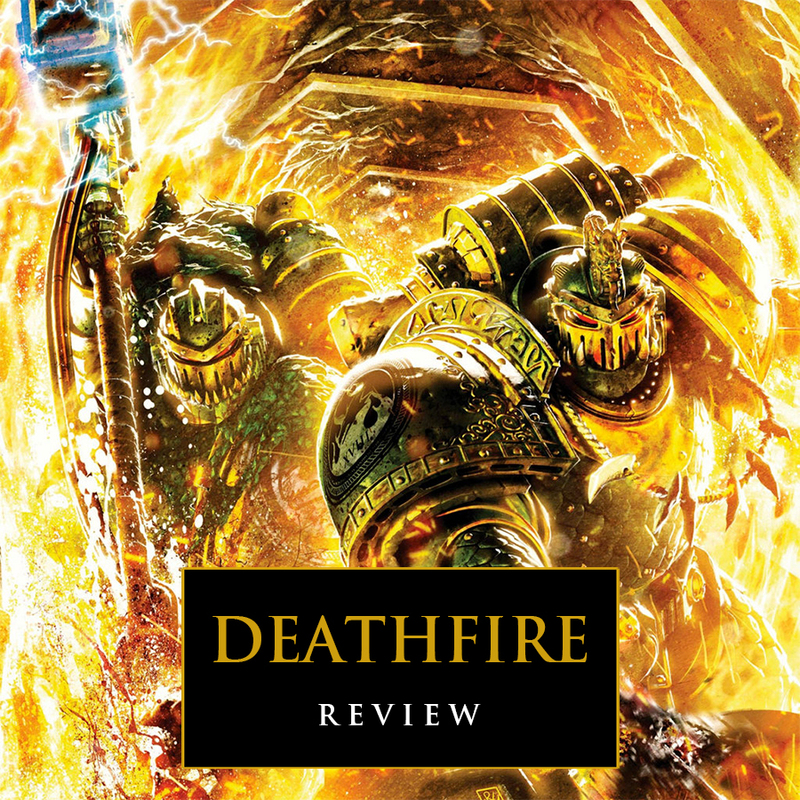 With Age of Sigmar in a bit of a lull at the moment, I was finally able to start catching up on the Horus Heresy and for me that meant Deathfire by Nick Kyme. Firmly planted in the Imperium Secondus storyline and more or less a direct follow up to Vulkan Lives, I was eager to see how the tale would continue and was pleasantly surprised by a returning character. The last Heresy novel I read was The Damnation of Pythos almost a year and a half ago, so it's been awhile. I read Vulkan Lives even further back, in 2013 when it came out, so an even longer time has passed. Despite this I was instantly excited to see the surprise return of a character I thought for sure was dead, Numeon. Numeon was a major character in Vulkan Lives, but was left for dead at the end of it. At the start of this novel we see that he was "rescued" in a sense by the Word Bearers, who nursed him back to health, just so they could torture him for information. Fortunately for him this doesn't last long and he is rescued by another familiar face, Aeonid Thiel of the Ultramarines from Know No Fear. It appears that he and his redmarked are now patrolling the outer reaches of Ultramar for lone vessels of traitors. After being rescued he is swiftly brought to the heart of Imperium Secondus, Macragge, where he is reunited with the other survivors of the Salamanders who had made it. It is also here where he is confronted with a truth he doesn't wish to accept, the body of his fallen Primarch Vulkan. Belief in Vulkan still being alive is what had kept Numeon going, and now, even with the evidence before his eyes, he refuses to accept it. Numeon is now the de facto leader of the entire Salamanders legion, being the highest ranking survivor, but it is a mantle he refuses to bear, believing that his father must still be alive. So fervent in his belief is he that he decides they must take Vulkan back to their home world of Nocturne and set him into the fires to be reborn. The 66 remaining Salamanders load up their Primarch's body into their one remaining Battle Barge and set off for home. However, there is one tiny problem, the Ruinstorm still blocks off all of Ultramar from the rest of the Imperium. To traverse it is essentially a suicide mission, something that Numeon is well aware of. The story sees the small group of Space Marines stop at a remote outpost near the outskirts of Ultramar before making their translation into the warp. There they find an ongoing raid by the Death Guard and pick up a mysterious grey clad marine bearing the sigil of Malcador and claiming to be on a very secretive and special mission. This is our first bit of action since Thiel's rescue at that start of the novel, and it's thoroughly engaging. Everything here is written at a very even pace, with the transitions from "slower" moments to action scenes handled well and always keeping the momentum going. There was never a point where I got bored or lost interest. If they weren't fighting against the traitors then the Salamanders were facing their own internal struggles as the various members of the 66 struggled to either accept the very heavy loss their legion had suffered, or railed against it with denial and belief. It's an interesting point in the Heresy timeline since the cold logic of the Imperial Truth is slowly starting to recede in the face of Chaos. The Edict of Nikea is no longer being followed by any of the forces, loyalist or traitor, and acceptance of things like religious belief and the supernatural are starting to prevail. If their enemies can conjure demons out of the Warp then why can't their Primarch return to life. It's an interesting debate amongst the survivors and what fills much of the downtime between battles. This is also the first time we really start to see this discussion take place. We had seen the inclusion of Librarians in other legions previously, but that had seemed to be their one concession. After fighting off the Death Guard at the outpost the true journey begins as they translate into the warp. Nick has captured the creepiness of Chaos during these scenes perfectly, as the fabric of the Warp starts to invade the material universe. Although some people may see what happens as a bit cliché, it definitely works and had me a little creeped out. Not only do they have to fight off Chaos itself, but the Salamanders are also pursued through the warp by the Death Guard and the very Word Bearers who had been responsible for Numeon's imprisonment earlier. They seek both the weapon that killed Vulkan which is still embedded in his chest, and the primarch's head as a trophy. I don't want to give too much more of the plot away, but it has a strong Odyssey vibe to it throughout, which I am sure is intentional. The last quarter of the book has a few twist moments that I really liked, with the final twist setting up my anticipation for the next novel in the Salamander's Heresy story. There's a really cool space battle, which I always enjoy, and a rather surprising cameo near the end as well. The final battle is definitely something we haven't seen yet in the Heresy. All of the characters feel fully fleshed out, with each of the Salamander's having their own distinct personality. I really liked the human crew of the Battle Barge too, who have their own stories, connections, and of course, a growing belief in the Emperor as a god. We also get to see Narek of the Word Bearers, who is imprisoned on Macragge at the start of the story and whose plot in intwined with the Salamanders and Word Bearers throughout the rest of the book. I feel like Nick Kyme has really hit his stride with Deathfire when compared to Vulkan Lives. The whole thing has a real sense of momentum without just being a constant string of battles. It was a quieter, smaller story then some of the other Heresy novels that focus on planet wide conflicts and entire legions going to war. This is a good thing since it lets us really connect to the few characters we do spend time on and let the plot be really concise while still having several curveballs here and there. The story focuses on the journey of the characters, both physically and mentally, as we watch a somewhat fractured and diminished group of Space Marines travel half the galaxy away in what very likely could be a fool's errand. At the end the legion that was most broken by Isstvan has started to heal and find it's place within the civil war that grips the Imperium. I definitely enjoyed Deathfire and it has reignited my passion for reading Horus Heresy novels, in fact I've already started in on Pharos next. 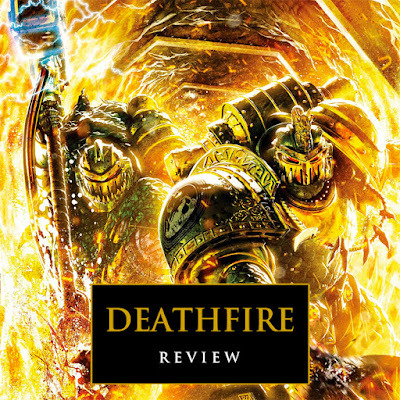 I highly recommend reading Deathfire, it's a great Heresy novel, fits neatly into the timeline with several connections to other books, and provides a unique framework for the story that we haven't seen used yet in the series. Like I said, this left me excited for the next Salamanders installment in the Heresy by Nick Kyme. I wouldn't advise starting out with this book if you are behind on the Heresy though. At the very least you will need to have read Vulkan Lives and Unremembered Empire beforehand, and Know No Fear wouldn't hurt either. Ideally you would want to be caught up on all of the books before reading this one, but at the very least I would recommend finishing those three first.